Linux is for those who hate Microsoft, BSD is for those who love UNIX. Never seen that frame before. Looks sweet. Although, not sure why there is a chain stay protector. still very bling in my books just going off the brand names on that bike, but certainly stealthy bling (or is that an oximoron?). A $2500 SS is bling in anyone's book. Nice ride though! Chainstay protector needs to go. It looks silly. Agreed. Still an awesome bike, and indeed Steve roolz. Massive stealth bling, if you ask me. Friend for life? You bet. No bling? With all the King parts on there it's the equivalent of an Escalade on Dubs. No bling?? So what exactly IS bling in your book??!! In my opinion, "bling" are items or components that don't necessarily add durability or performance but are selected for cosmetic reasons. I've had Chris King headsets in bikes that are many, many years old. I've never had to adjust them, rebuild them and they have never, ever failed me. They go on all my bikes and I never worry about them again. 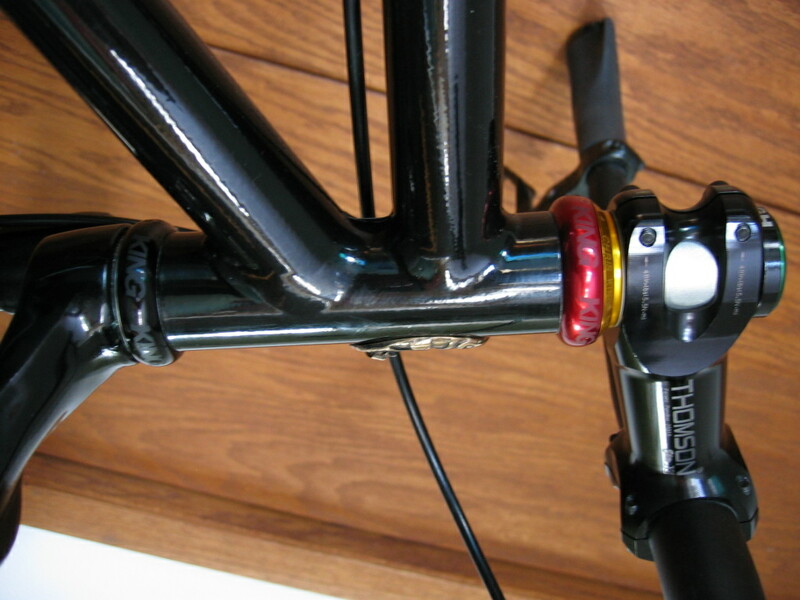 Same with Thomson seatposts and stems. I've never had issues with creaking, slipping, breakage or issues of any kind. They go on all my bikes and I never worry about them again. The Chris King hubs? These where my first set of SS specific hubs and somewhat new to Chris King's product line. However, I had standard MTB wheelsets with Chris King hubs and they again, worked perfectly with very little fuss or maintenance. I wouldn't hesitate to use this setup again. 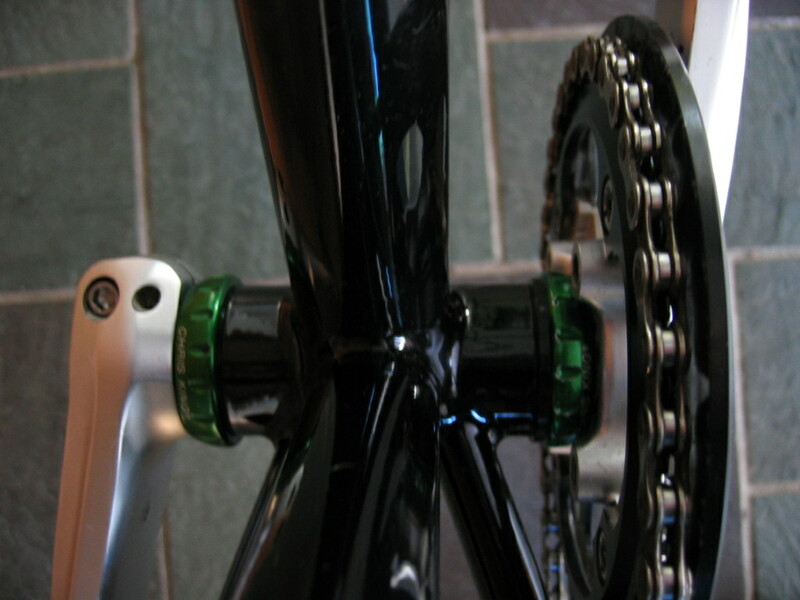 Chris King bottom bracket? Well, he knows how to make a headset and knows how to make hubs. 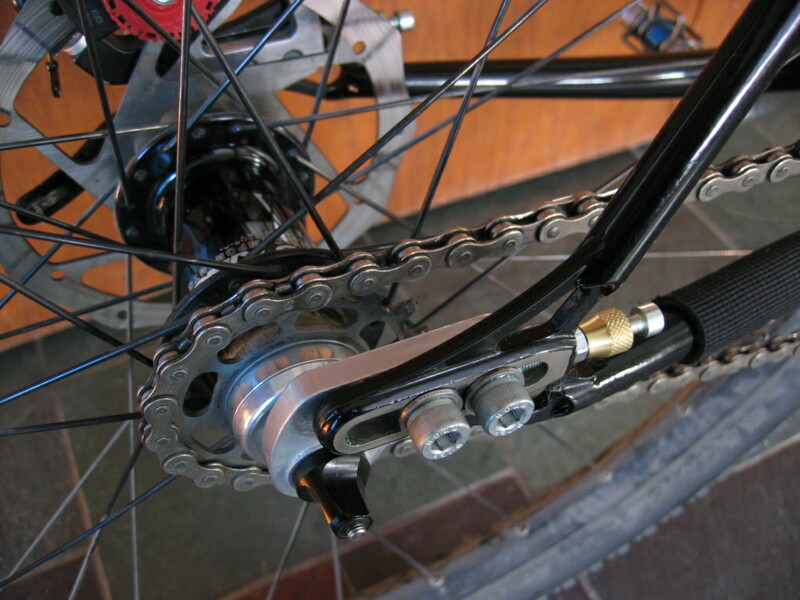 Why not try a bottom bracket? I've had this BB on three different frames. It installed perfectly, the build quality is exceptional, and it has performed without a single creak or noise or need for adjustment of any kind. These will go on all my bikes and I won't worry about them again. Yeah I know there are other bits that will offer the same performance, durability, and so forth. These are MY preferences. You don't have to agree, and you probably shouldn't agree. Don't want to argue about it or convince others otherwise - don't care frankly. Is the Coconino frame bling? Not to all. 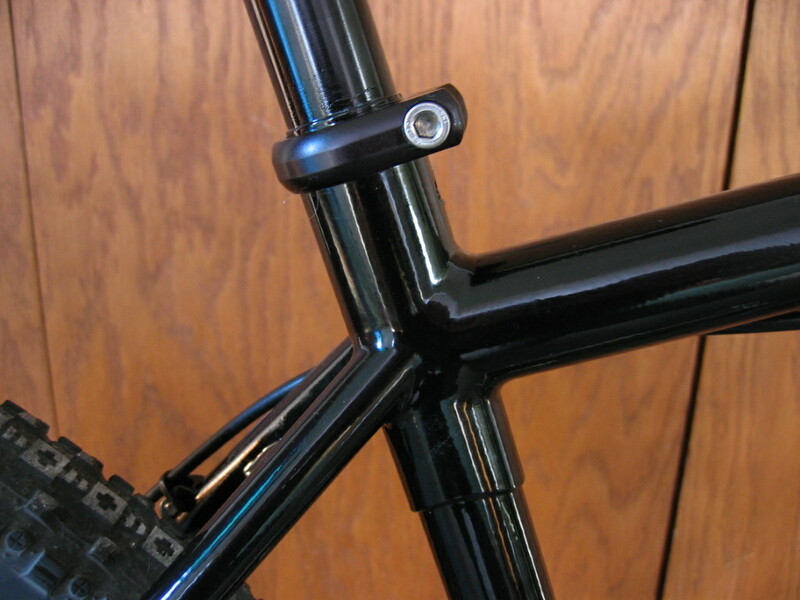 Steve Garro is a down to earth guy that happens to enjoy building custom bicycle frames for a silly reasonable price. The time, thought, and sweat equity he puts into each build is unparalleled. I simply wanted a solid, steel, single speed specific 29er with Paragon sliders - I could not find that from an "off the shelf" manufacturer. I've had two custom frames built, this is my third. I liked the idea of stainless steel Paragon drop-outs. Thing is, you have to use silver solder to adhere the two dissimilar materials together (steel and stainless steel). Steve does this. I purposely didn't want a loud paint job to draw attention, not my thing. Don't really care who knows what kind of rig it is, who made it or how much it does or doesn't cost - it's not for anyone else to know. Unfortunately, the black color hides much of it's craftsmanship. Craftsmanship doesn't begin to describe Steve's work. He's a true artisan that takes care in frame building to an absurd, almost maniacal level. Not only is his material selection impeccable, joint work without flaws, but the technical alignment is perfect - and I mean perfect - not close, not a little off, but perfect. I took calipers to this thing looking for errors in alignment, they are always there, even in the most expensive of builds. Not here, nothing, spot on, exact. Unfortunately, you don't find this level of quality many places, so one has to know what they want and pursue it, look for it. Single speeds are my passion and I wanted a build I could live with for a lifetime - this is the result. If this process is considered bling? But you didn't explain the chainstay protector. There is alot to be said about a custom steel frame! Sure you can pick up a nice Ti frame for the same pricing but it won't be custom. I agree with you on the bling definition. Sure I think we all like bling to some degree and it would appear that Chris King has sort of raised the anti a little by offering a good product. Yes, some of the parts cost a little more but I can't say enough about their reliability and the same goes for Thompson and even White Industries (hubs/cranks anyway). Oh, and we can't forget to mention that King offers them in a ton of colors which does help to make them pop a little bit more depending on contrasting colors. Overall, a good build up imo and a very nice frame. I took a look at his page and blog page. Lots of work went into that beauty! still wondering what the reasoning is behind the chainstay protector. 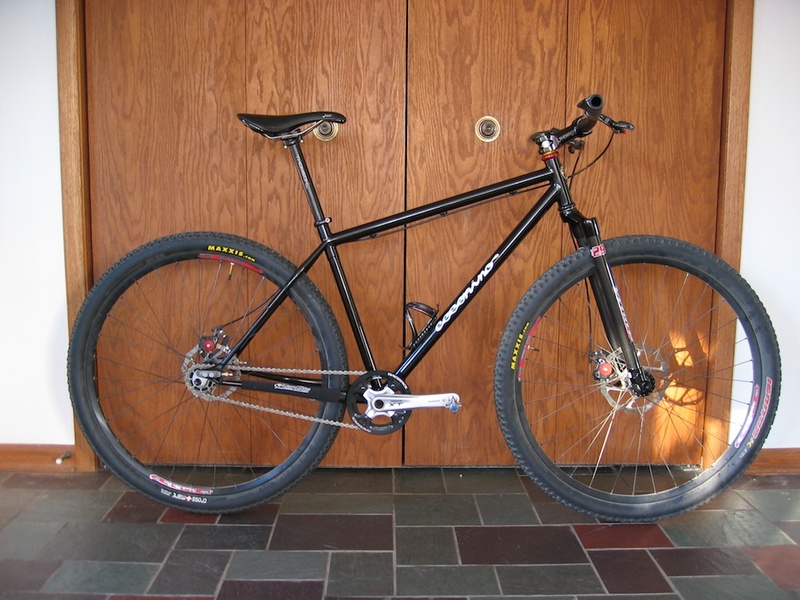 i don't see how they're similar except they're both singlespeed and painted black. 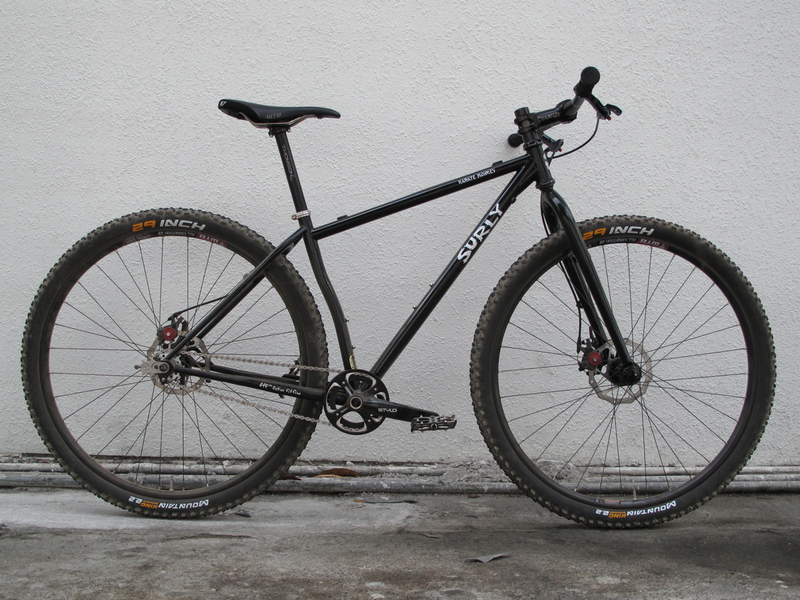 The chainstay protector is kind of stupid and dopey, and clearly ruins it for some. 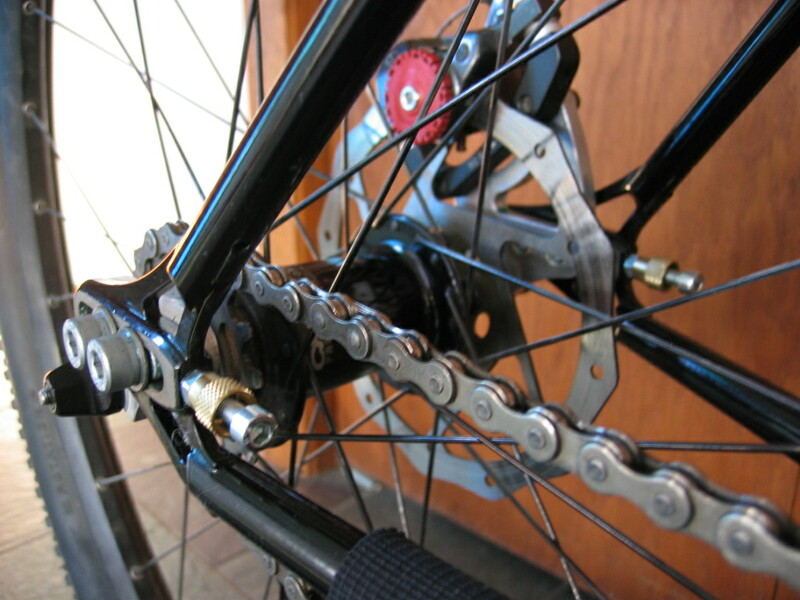 It's on there so when I clean the chain, switch cogs or pop the wheel out, or do any kind of maintenance, I like the idea of not smacking the stay with a chain. OCD behavior for sure, need to work on that a little. Use it to wrap your spare tube/tire levers/CO2/multitool. That way, it's there when you need it, and it won't get gunked up on the chainstay. As far as the line between "hey, nice bike" and "blingtastic", there's a lot of subjectivity there. One man's bling is another man's go-to build kit; high-end parts alone do not a blinglespeed make, ATMO. I might be a little biased, but I don't think your build is excesively appointed, especially compared to those Ti frames with all the matching anodized bits. Besides, you don't have to justify it to anyone but yourself.